Dustless sanding where do we start? Many things have already been said about the merits of the Mirka Ceros Dustless Sander or the Festool by some very knowable decorators from across the globe. Including Simon Spectrum Decorating (who had been telling me I was a fool not getting one for ages. It pains me to admit, but he was right) and Andy Crition the Traditional Painter. I am not saying we didn’t believe them but up until recently we really were not to bothered about investigating the equipment as what’s wrong with a bit scratch (normal sanding paper) and elbow grease. GS Decorating have been doing this a long time and if we didn’t know how to sand a room and keep it tidy at the same time I would be worried. Do we really want to be dragging a big hover all over the place? Lugging it in and out of the van, leaving it to sit there until we need it? Well, we thought not! We tried a Festool (sorry not sure of the model) about three or four years ago and were not that impressed by it and for the then asking price about £1,000 it just wasn’t worth it. A luxury rather than necessity or so we thought. We had even come up with our own dustless sanding invention that we were considering patenting. This involved normal sand paper, a bit of elbow grease, a lid from any old household bin and someone stupid enough to stand underneath you while sanding. It was a tad rough around the edges but it works and didn’t cost the best part of £600 + (current average price). But let’s think of it this way with out one of these new super dooper sanding machines what equipment do you need to use to sand properly, as decorators have done for years before us. Correct grade sand paper for the job at hand. Unfortunately, we just got used to this and it works, so why change what isn’t broken? On a trip to the painting and decorating show in Coventry, after a year of denying ourselves any treats, GS Decorating were itching to spend some money. I think on that day we would or probably bought a Van with no engine if the salesman was good enough! But we came away with a lovely Mirka for £550, which was £100 under the asking price for buying it there and then. A bargain we will have two please! Right onto the matter at hand, are they any good? As people who were not convinced about it and just wanted to buy something would we be converted? I have to say, a resounding YES! You have got to say it’s a well made, solid peace of equipment that oozes a bit of quality. Think Henry the Hoover with attachments. It’s lightweight, quiet and with a hose long enough to stretch far enough around a house while it sits still in the middle. They are great for you Kaizen principles allowing for greater efficiency in the workplace. Now GS Decorating still have to sheet up but unlike before where once you had finished you would spend ages cleaning out your sheets getting rid of all the dust now, for the best part the dust has already been taken care of by the Mirka. When sanding ceiling, walls and woodwork with the Mirka you’re not getting a lungful of dust coming off surfaces that can be made from a variety of materials. Great news for everyones health and it will also put smiles on your customers face as they see their property is well looked after. Normally when in preparation and dusting mode (the old school way) the air does get full of dust and even with the most careful of decorators, it’s near impossible to stop it creeping around the property. Which you will then have to clean! 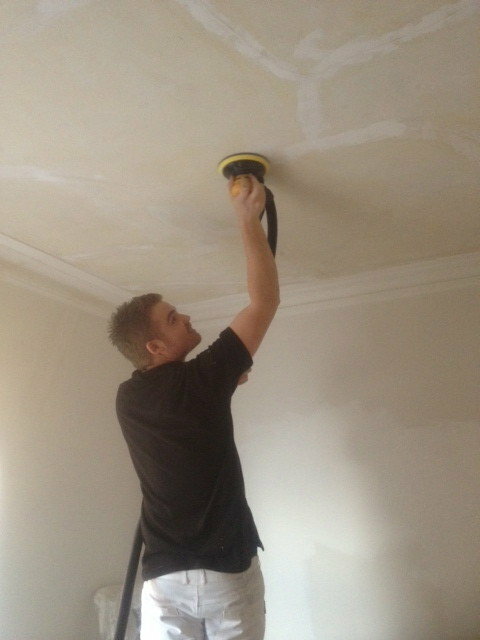 With the Mirka this is no longer an issue, even sanding ceilings is no longer a pain, so no more faces full of dust. It’s also got some lovely little features and everyone probably likes different things but we love the push on/off button on the palm sanding attachment. Being able to turn it on and off while in use without having to go to the main unit every time is a blessing. It’s the little things that keep us happy! Included with the package comes all the various weight sanding grits that would suit any decorator in any situation. 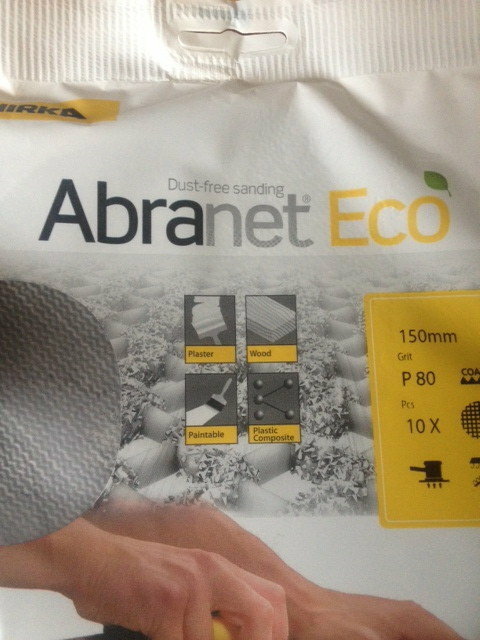 Unlike normal sanding paper that when in use it will generally clog up with grit meaning you are constantly using new pieces of paper the Mirka Abranet doesn’t due to their sanding net design and the dust being sucked away at a phenomenal rate. We’ve only had ours for a few months now but in that short time its taken some heavy use and we don’t think you will have to be splashing out on new pads that often. It also doubles up as a normal (very powerful may I add) vacuum cleaner. It was a sad moment when Henry retired to the garage but the old boy had served well. Now the Mirka has replaced him while he’s living out his final days in peace. It also folds away into a nice tidy compact unit that’s easy to carry and looks top notch. For the more intricate areas we still use sand paper and we still wouldn’t go anywhere without our shelves of every grade paper under the sun (just in case) but in general they won’t be needed as the Mirka has the angles covered. So all in all we are more than happy with our impulse purchase and would recommend them to any decorator worth their salt. They can seem a bit pricey but in efficiency they are worth their weight in gold and will more than pay for itself over its life span. In summary they are good. Go and get one! If you are looking for high quality painters and decorators London, please feel free to contact GS Decorating for more information. GS Decorating have a successful history of undertaking both residential decorating and commercial painting for clients throughout London. Decorating London’s residential and commercial properties we are always happy to help with your up-and-coming projects. If you’re looking for painters in London contact us now. Thats a brilliant review of the most essential piece of kit in a good painter’s kit bag! You should get down the “office” on a Friday more often! Look forward to plenty more of these mega good articles. Great review, and having looked at one or two videos on the net as well, it really does look like a great piece of kit. The only question that springs to mind for me is how well it performs on wood, and specifically two-part filler? It clearly doesn’t have an issue with plaster, but would you say it’s up to the job, say, on new skirting where you’ve you used a two part filler on fixing holes? I would always tend to power sand in such a case, and from experience, a Makita palm sander (or equivalent), is the tool for the job (but obviously you get a chemical dust storm!). Would love to know if you’ve tried the Mirka in such a situation. thanks for your comment. Yes the Mirka is fine on 2 part and skirting. The orbital sanding kit really can handle most things apart corners, which you can get other attachments for. However after a few more months use, I am contemplating changing my review as the hoover part is pretty useless in our opinion. We have stopped using it as a general hoover as well as a sander now and Henry is back on board for all general hoovering duties. The bags fills up & split’s easily and they are way to expensive to keep changing. 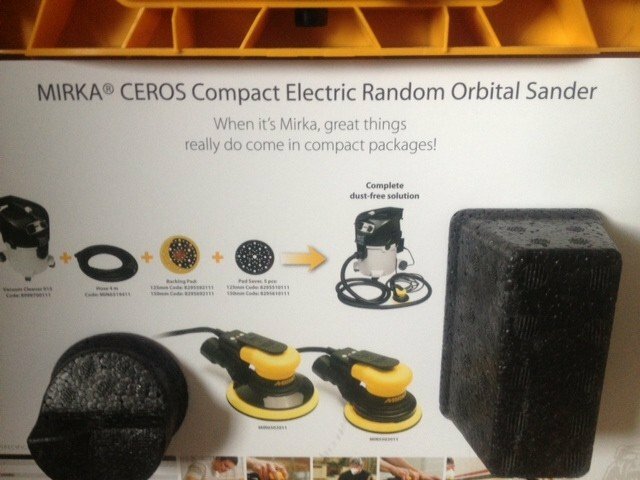 So we only use the Mirka for actual sanding now, so there is only dust in the bag which is then easy to keep emptying. Also we keep on getting red warning lights and suction goes alot. So I would recommend not buying the hoover part of the kit. Which is about £400/500. It can attach straight to a Henry and this seems to work pretty well, not quite as good but a good compromise if on a budget. Its a shame as Dustless sanding is amazing and is a game changing piece of equipment for decorators but we dont think the Mirka is a good a complete package as we originally thought. We are thinking of getting a Festol soon and give that a road test. So it does pass the 2 part test, but interesting to hear about the hoover issue – especially for the money. Thank god for Henry! Be interesting to see the difference if you try the Festool. Just bought the sander but by the sounds of it saved loads by not purchasing the Hoover as I use a Henry…. I understand there’s a converter you have buy for it yo fit the Henry …. Where can you get this fitment ? ?